A Shepherds Tale: Pedicure for 70, oh dear!!! One of the hardest jobs we have to do with the sheep is foot trimming, which is done twice a year along with worming. The photo shows our sheep turner, complete with sheep to model it, which is probably the most useful piece of equipment we have bought over the past years of farming. When we first started we had to physically turn each sheep over, then trim their feet which required leaning over the animal, this was back breaking work and very tiring. I would trim the feet and administer the wormer while the OH restrained the ewe. As the size of our flock increased it became our most dreaded job. At a Sheep show we visited we saw a sheep turner being demonstrated, it seemed to be the answer to one of our most difficult jobs. As these pieces of equipment are quite expensive I decided that I needed to try it first to make sure that it was as easy as it looked. As was always the case 10 or so years ago I would be the only woman asking questions or demanding demos, so it was with some trepidation that I stepped up to the man who was handling the equipment. I could feel all the farmers looking at me as he showed me what to do. I succeded in pushing the sheep into the turner and then pulled the various levers that lock the ewe in position, and then with a bit of effort I managed to swivel the ewe back into the work postion. A small round of applause followed at which I turned a delicate shade of pink. It was after that demo that we bought our own sheep turner and now cannot imagine having to do 70 or more ewes without it. Admittedly we still have something of a struggle to get some of the bigger ladies in, we really must put them on a diet! !However you can see from the photo that once they are in they are quite calm and it actually makes trimming their feet much quicker for all concerned. At the same time as the pedicure they also receive a routine worming. However an even worse job that has to be done sometimes is dagging, this involves cutting away "dirty" wool from around their tails. We used to do all the ewes before lambing but as numbers increased it became impossible so only the ones at risk are done now. Dagging is neccessary in Spring to avoid "Fly strike" a very unpleasant problem that can occur before shearing. As I have explained before a particular type of fly lays its eggs in the wool and these turn into maggots which feed on the animal. They can also affect their feet which is one reason why we have to keep them trimmed. 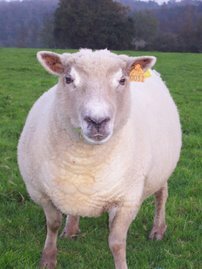 Often the first indication of "Fly strike" is when the ewe becomes depressed and stops eating and often moves away from the flock. It can take several weeks of care to get the animal back on form so it is obviously better to avoid the problem if at all possible. We have noticed over the years that the ewes have become more demanding and are no longer content with a simple pedicure and haircut they now want red nail polish and a blow dry. We think we are too soft with them sometimes, although we have drawn the line at botox and colonic irrigation!!!!!!!!!!!!!!!!!!! Lets face it the rams don't care what they look like. an i thought stirrups were bad at the ob/gyn! Yet again you continue to amaze me! Oh my God, that is the most peculiar-looking contraption I have ever seen in my life!! Does it work on children and, if so, can I borrow it!?!? There's a word in use in my rural part of England, 'daggy', meaning a bit grubby, moth-eaten, generally substandard. I wonder whether it comes from 'dagging'? It's not listed in dictionary.com. The end of your post made me laugh. I love the sheep in the contraption. It looks fabulous! You live such a glamour filled lifestyle! Oooh yuk. Poor sheep. I thought being a sheep kept you from such indignities but it's just as bad having a smear! Wanted to pop by and say hello, as I hope I'm back and blogging now.